Research has shown that a developing child's brain structure and function can be adversely affected when the child is raised in an environment lacking adequate education, nutrition and access to health care. While the impact of such an environment on children is relatively well understood, a new study from The University of Texas at Dallas examines an effect that is not so clear—the relationship of socioeconomic status (SES) to brain function and anatomy in adults. "We know that socioeconomic status influences the structure of the brain in childhood and older age, but there's been a gap in the research. We wanted to see if there were relationships between SES and the brain across a wider range of adulthood," said Dr. Gagan Wig, assistant professor in the School of Behavioral and Brain Sciences at UT Dallas and corresponding author of the study published online in the Proceedings of the National Academy of Sciences. The study included 304 individuals ranging between 20 and 89 years of age. Each individual's SES was approximated using standard methods that combine education and a measure of occupational prestige. The SES measure was also correlated with individual income and reports of subjective SES standing. To measure brain function, the researchers used functional magnetic resonance imaging to collect a type of brain scan that shows how an individual's functional brain networks are organized while the participant lies in the machine in a state of resting wakefulness. 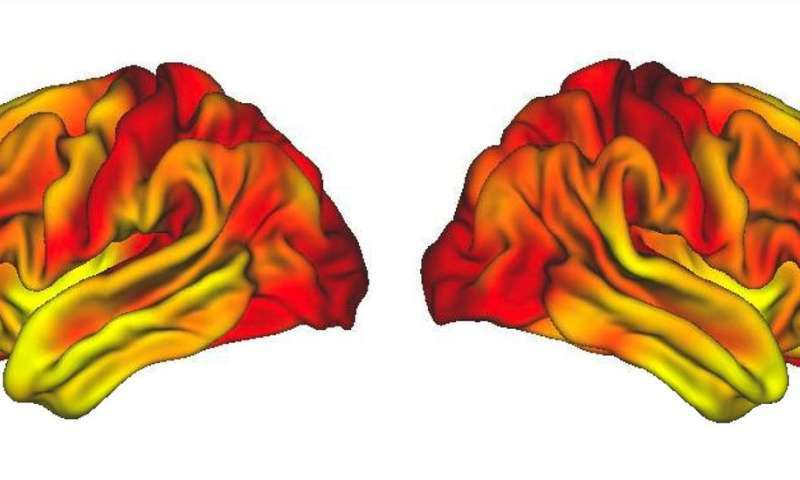 In addition, the researchers used anatomical brain scans to measure the thickness of cortical grey matter in each individual's brain. In middle-age adults, ages 35 to 64 years, a higher socioeconomic status was associated with more efficiently organized brain networks and thicker cortical grey matter. Those who ranked lower in SES tended to have less well-organized functional brain networks and a thinner cortex. A thinner cortex can contribute to cognitive impairment later in life, such as memory loss and dementia. "We know less about the impact of brain network organization on later life outcomes, but these results suggest that it is worth further study," Wig said. The SES-brain relationships persisted after controlling for demographics, measures of both physical and mental health, and cognitive ability. In addition, the relationship between an individual's present adult SES and their brain-network organization was independent of his or her childhood SES, providing evidence that the SES relationships are not simply due to differences that have been previously established during the earliest years of life. "These data provide a snapshot in time for each participant," said the study's lead author Dr. Micaela Chan, a postdoctoral researcher working with Wig at the Center for Vital Longevity. "Following individuals through their lifespan would provide more information about brain changes and their relationship to life events and status." "What we have found in middle-aged adults is a correlation between socioeconomic status and brain function and anatomy," Wig said. "What makes these results more striking is that the individuals we studied were predominantly above the poverty line. This provides evidence that SES-brain relationships are not limited to individuals at the extreme ends of SES, but are present across a broader SES range. However, because differences in SES can be associated with differences in many factors, including those related to diet and health behaviors, access to health care, and levels of stress, it's not yet clear which of these, if any, is the source of the observed relationships. "The bottom line is, socioeconomic status might matter for brain health, even in middle age, and we will need to investigate the relationship further," he said.